Which East Asian country is Iranian Foreign Minister Javad Zarif slated to visit starting September 15, 2015? In which country is the Tavan Tolgoi coal mine located? The Tavan Tolgoi coal mine in southern Mongolia is one of the world’s largest undeveloped coal deposits–estimated to contain reserves in excess of 6 billion tonnes of high-quality coking coal used for steelmaking. In a 2012 article remarking on Mongolia’s high economic aspirations The Economist quipped, “To pay for these dreams, Mongolia is being dug up and sold to China.” But in the case of Tavan Tolgoi, the digging has stalled, again. What is the cause of the haze that pollutes air over Malaysia, Singapore, Thailand, and Indonesia on an annual basis? Every year, fires are lit to clear land in Indonesia. The government blames poor farmers while ignoring local as well as Malaysian and Singaporean companies whose environmental practices have seen schools close, people ordered inside and hospitals inundated with patients. The dreaded haze adds billions of dollars to the cost of doing business. For years, that haze has annually choked some 200 million people across much of Indonesia, Malaysia, Singapore and parts of Thailand. Recently, the U.S. State Department awarded a contract to a firm to provide the Philippines with what maritime security enabling equipment? The Philippines will receive four new patrol vessels from a U.S. company in November 2015, the firm announced September 3. According to Willard Marine Inc., the U.S. State Department had awarded it a contract to provide the Philippine National Police Maritime Group with patrol vessels equipped for search and rescue operations along the country’s maritime borders. 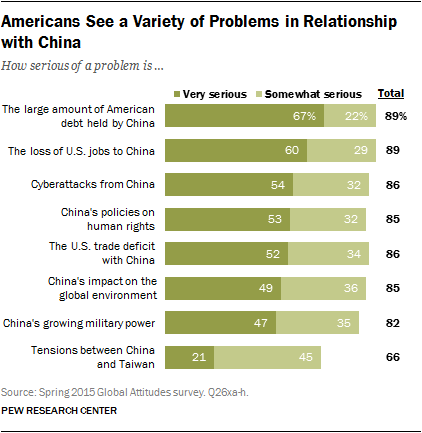 In a recent Pew Research survey, what did Americans cite as the biggest problem for the United States posed by China? What’s concerning about the findings is that a major myth, namely that China “owns” the United States because it holds massive amounts of U.S. debt, is at the top of what Americans perceive as troubling about the U.S.-China relationship. In fact, most U.S. public debt is held by U.S. entities and individuals. China has at times held nearly 10 percent of the total U.S. debt, which stands at around $17.5 trillion or 103 percent of U.S. GDP as of this year, but that doesn’t mean Beijing has any real leverage over the fiscal health of the U.S. government. According to the U.S. Department of the Treasury, as of June 2015, the top holders of U.S. debt are China, Japan, “Caribbean Banking Centers,” and oil exporting states. China and Japan hold nearly the same amount of U.S. debt in absolute terms, but there is little doom and gloom regarding Japan’s stakes. Regardless of the facts, Americans continue to see China’s ownership of U.S. national debt as a problem. What’s worse, in 2014, 78 percent of respondents told Pew they saw the debt issue as their top concern. The 2015 results show that now 89 percent of respondents cite the issue as their top concern about China. Instead of declining, this misperception has intensified among Americans. Which of the following countries is not a member of Asia-Pacific Economic Cooperation (APEC)? 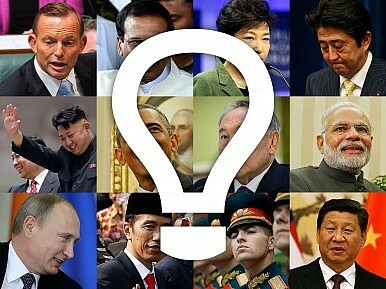 New Delhi has sought to join the group to no avail for more than twenty years. In recent years, India has slowly started to gain the support of the United States for its bid to become more involved in APEC. In 2011, the United States invited India to participate in APEC as an observer (the forum met in Hawaii that year). Indian Prime Minister Narendra Modi raised the issue of Indian membership in APEC when he met U.S. President Barack Obama in January, when the U.S. president visited New Delhi as the guest of honor for India’s Republic Day parade, and Obama expressed support for India’s membership in the organization. In addition to the United States, Russia and China have also welcomed India’s participation in APEC. China’s foreign reserves fell by a record $93.9 billion last month to $3.56 trillion. What is the all-time high for China’s foreign exchange reserves? China’s foreign exchanges reserves fell by a record $93.9 billion last month, marking the fourth consecutive month of dropping forex reserves, the People’s Bank of China announced on Monday. China’s forex reserves previously dropped by $40 billion during the second quarter of 2015, hitting a nearly two-year low. The levels began dropping for the first time in a decade in the third quarter of 2014, Xinhua noted. Between January and March 2015, approximately how many Rohingya fled Myanmar and Bangladesh? In 2014, Japan received approximately 5,000 applications for asylum? How many did it approve? Japan has never been famous for its acceptance of foreigners – and this insularity shows in its refugee policy. While no one can find fault with Japan’s financial generosity in support of refugees, its acceptance of only 11 candidates out of about 5,000 asylum applications in 2014 is nothing to be proud of. Last year, Japan gave $181.6 million to the United Nations High Commissioner for Refugees (UNHCR), the UN’s refugee agency, making it the second largest donor behind the United States. In the first half of this year, Japan has already given $167 million to the UNHCR, again, ranking second. Furthermore, back in January, when Japanese Prime Minister Shinzo Abe visited Egypt, he pledged $200 million in aid specifically for refugees from Iraq and Syria displaced by the rise of the Islamic State (IS). What, according to a recent Lowy Institute report, is a major shortcoming of Indian and Chinese submarines? While U.S. and Soviet missile-carrying ballistic submarines (SSBNs) with their invulnerable second-strike capability have helped maintain nuclear deterrence – and as a consequence peace – during the Cold War, Chinese and Indian subs in Asian waters today could trigger instability and conflict for the simple reason that they are just still too easy to detect. This is the argument put forward in a new paper by the Lowy Institute, which states that Chinese and Indian ballistic missile submarines are not yet technologically advanced enough and too few in number to provide their respective countries with an invulnerable nuclear arsenal that would deter an aggressor from launching a nuclear attack for fear of retaliation.